In line with its competitors, Microsoft has been rumored to be developing a fitness wearable for some time – and now we have proof. Although the company hasn’t ‘officially’ released the device, a Microsoft Band Sync app has appeared on the Mac app market, likely an accidental leak. While the app doesn’t answer all our burning questions, it does provide some details. 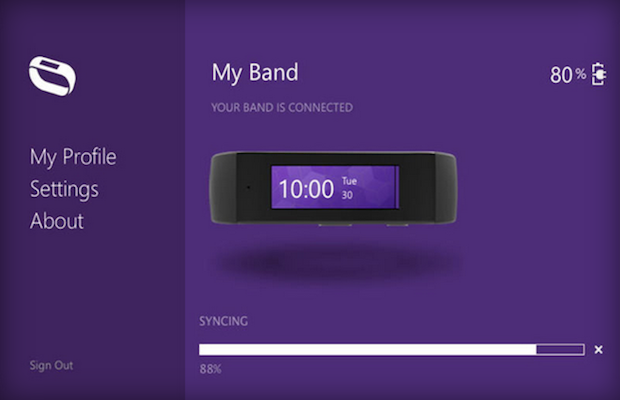 The Microsoft Band, as the app calls it, looks pretty sick – images show a sleek black band with a horizontal display. And the text reveals some features: the device can track heart rate, steps, and sleep to help achieve fitness goals; it will also sync with the user’s smartphone and include Cortana integration. This app gives us a pretty good idea about what’s in store for the Microsoft wearable market. Yet, there’s still more to learn. All we know is, whoever leaked this app is SO fired.